The following collectibles are not for sale. 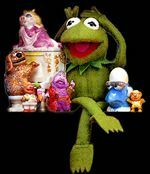 They serve as a reference of Henson memorabilia released over the years. Fill out our help form to contribute to our guide. Read our FAQ to find answers to your merchandise questions.